I love the Internet. It’s a wild and random ecosystem with very few guardrails or black-and-white rules on how to “do the Internet right.” One of my favorite aspects of the Internet is just how low the barrier of entry is to jump in and play; the tools and access to technical education are improving every day. Unfortunately, there are still some hard expenses associated with getting a website out into space and that can really take the fun out of playing (and learning) on the Internet. With that in mind, I want to tell you about a new website I launched: FootballCropTop.com. While I think it’s important that there is now a website dedicated exclusively to helping you find crop top shirts adorned with your favorite sports team branding, I think it is far more interesting to share, step by step, how I built and maintain FootballCropTop.com for, what shakes out to be, 10¢ per month. In addition to being, in my opinion, a hilarious and random domain name, it is obvious what is offered on FootballCropTop.com without ever having to go to the website. If you knew that it offered crop top shirts adorned with your favorite sports team branding straight away then I think you know that it is an amazingly high quality domain name. Not youboob.com quality, but it certainly establishes the very precise niche it represents, both from a conversational and a keyword perspective. Sidebar - From an academic perspective it is incredibly irresponsible to buy a domain name before you know that you have a market-validated use for it. I’m more transparent and messy than I am academic, so here’s what really happened. I was watching some sweet college football tournament action with some friends and was delighted with just how many players were wearing crop top jerseys. We had to know more! Most importantly, we had to know where we could buy our own! I noticed FootballCropTop.com was available so I bought it without anything specific in mind. I just thought it was funny and it was available. What exactly is my content? Are there affiliate programs, with APIs, that feed these products? How many potential customers are there? What do they search when they want crop tops? In the end, I discovered that crop top product listings associated with affiliate links would be the best content. So I needed to find a proper affiliate; and more importantly one that offered an API to access product updates programmatically. Though I am not selling something directly (simply linking to affiliate ecommerce sites), I did want to provide an ecommerce-esque experience. I shopped around for ecommerce sites that offered branded football apparel. A quick Google search turned up Fanatics.com. I searched their inventory for “crop tops” and found just shy of 200 products available. Great! That is more than enough for my goals. Then I did a bit of digging and discovered that they offered an affiliate program via two providers; one that I had worked with before, ShareASale. The ShareASale program offered an API to access a product feed from Fanatics.com. A quick pulse check shows no major roadblocks and the path looks pretty clear from here – let’s plow forward! I frequently use Jekyll for personal projects - it is a static site generator built with Ruby that gives you a ton of power to build and maintain plain old HTML websites. Working with it feels like working with a CMS or other server-side application, but it doesn’t need to actively run on an application server; it simply spits out HTML files which can be hosted almost anywhere dirt-cheap without much concern around scaling. Another resource I use frequently are the HTML/CSS/JS templates available at HTML5 UP. They offer a great selection of modern, responsive templates for free (with attribution) that give you a great starting place for a brand new project or MVP. I don’t look at these templates through the lens of “this is my site always and forever.” I just want to find something appropriate for my content that allows me to begin building a site without getting hung up on style and layout issues at every turn. You can always go back through the project and replace the template with relative ease later. Since I harvested a general plan and vision from the previous steps, it was easy to scroll through the options and zero in on a design that I wanted to start with. I fired off a jekyll new footballcroptop.com into my terminal and started building. I began to get a feel for how I wanted product data to flow through the Jekyll app by creating a products.json file (with dummy data) in the _data directory and used that to loop over products on the list and detail pages. I was satisfied enough that I wanted to start to get some real data. 159 records later I ran a script to convert CSV exported data from the table into JSON and added a teams.json file to the _data directory. This would serve as the foundation of my categories: leagues, conferences, states, cities, and teams. I created the initial version of a product_organizer.rb Ruby file in the _plugins directory and used Jekyll’s Plugin Hooks to trigger this organizer to run after_init (“Just after the site initializes, but before setup & render. Good for modifying the configuration of the site.”) This initial version of the organizer was tasked with looping over all the teams and creating individual data collections for each of the category types based on the distinct values of the teams.json. I share the final product organizer code a bit later. I used these categories to layer in product list pages for each category, as well as some basic link lists in the footer of the site. Now, I’ve got a basic skeleton of a site and I am ready for real product data. The site was still only running locally on my machine and I thought I could apply for access to the affiliate program without having launched the site yet. I was wrong and my application was denied - and with a very vague reason that didn’t say “Yo! You don’t have a real website!” I decided to rectify that and move forward with launching the site in a “staged” capacity with real product information but not active affiliate links (because I didn’t have them yet). I posted a job on Upwork.com asking for a freelancer to visit the search results page for “crop top” on Fanatics.com and manually extract the data for the approximately 170 products listed in the search results, returned in a CSV file. I offered $10.00 for this job and someone took it within 10 minutes of posting. I replaced my dummy data filled products.json with my staging data filled products.json, then tweaked my product list and detail page templates to use this new structure. I ran jekyll serve and it looked great. Now to deploy it somewhere. Github offers free hosting for static HTML websites via a product called Github Pages. Additionally, if your static site is built with Jekyll, they will use their own servers to perform the build operation and deploy the generated site files to their servers. I do this frequently with simple Jekyll sites. Unfortunately because of our product_organizer.rb plugin, Github will not allow my site to be built on their servers. There are workarounds for this which involve multiple branches in your project and a bit of command line gymnastics. My goal here is “simple and maintainable” so I choose not to go that route. Instead, I will build (for free) and host (for pennies) elsewhere. Codeship is a player in the Continuous Integration (CI) space; I’ve been a customer for a handful of years. They offer a free plan for projects that don’t have a lot of build activity or tax their infrastructure too heavily. This plan is more than adequate for my needs. The product offers a Just-In-Time (JIT) container based build process as well as a user interface to configure deployments to S3. I created an S3 bucket (with “static website hosting” enabled), set up the basic project build and deployment settings, then committed my code to a repo on Github; we’re off to the races. Every time I commit code to the master branch, this build and deployment process will kick-off and run. After years of building simple static HTML sites for one-off silly (or ridiculous) projects, I’ve learned to embrace a CDN early on. In my opinion, it’s easier to layer it in early and not need it than it is to insert it later, especially if you are under load. I set up one distribution that points to one custom origin for the URL offered by the “static website hosting” feature within S3. After this distribution was (finally) deployed and ready, it was time to point my domain to the hosted content. A habit I’ve picked up is to always configure SSL for my projects. At this point in my life I will not launch a new website without adding SSL support. This used to be kind of expensive. Fortunately for us all, LetsEncrypt is a low-cost (sort of free) solution for obtaining SSL encryption for your projects. The actual certificates are completely free. The “sort of free” part comes from a requirement by LetsEncrypt to renew the cert after a matter of weeks rather than annually. You will need to do this manually (ugh!) or find a tool that will automate the renewal and deployment of updated certificates. For my non-static personal projects that require an application server, I use a couple of Droplets in my Digital Ocean account, mostly running PHP and MySQL. I use a tool called Forge to provision and maintain the configuration of those Droplets. One of the awesome features of Forge is automated renewal of LetsEncrypt certificates. I updated the DNS for FootballCropTop.com, set up an NGINX reverse proxy on Digital Ocean to the Cloudfront distribution I created earlier, and requested a LetsEncrypt certificate. Now the site is alive and well, accessible in browsers everywhere; especially by the fine folks at ShareASale. I replied to the denial notification email from ShareASale and asked if they would mind reviewing my application again. It took a bit of doing and follow-ups but they finally re-evaluated my application and granted me access to the Fanatics.com affiliate program. In order to access the product feed API offered by ShareASale you will need to configure some basic security and access controls. One such control is an IP whitelist feature. This requires you to explicitly define all (up to five) of the IP addresses that will be allowed to access the API using your access credentials. This means you will need to have a static IP address somewhere out in the wild. With this little piece of infrastructure in place I am free to begin consuming the product feed data from basically anywhere. Real-life data tells the real story and now that I have unrestricted access to the product feed data for Fanatics.com, I can start to dial in the requirements of the product_organizer.rb plugin to organize the product data for successful generation of the Jekyll site. 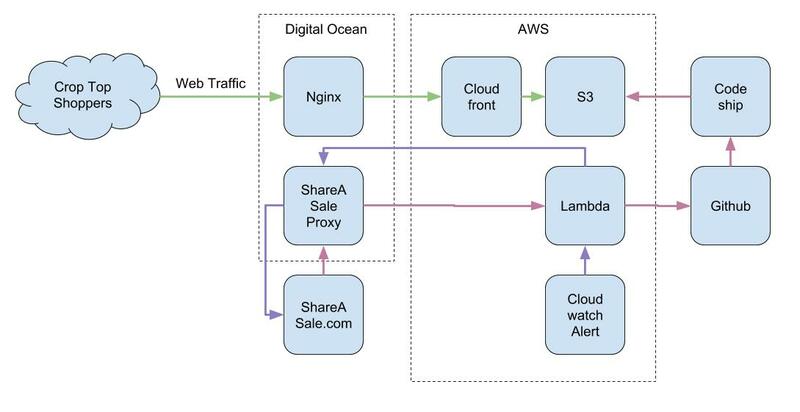 Amazon Web Services (AWS) offers a product called Lambda, which I’ve mentioned before, that is a great tool to off-load one-off processes to an isolated pool of resources where you only pay for what you use. In the case of FootballCropTop.com, I only need the service to wake up once per day, fetch the latest product feed from ShareASale, and initiate a new build of the project with the latest products. I don’t want to pay a monthly fee for a server to be up and running, on my dime, when it won’t be used 99.999999999% of the time. Finally, I set up a CloudWatch Rule to trigger this Lambda function once per day. Voila! Automated daily refreshes of FootballCropTop.com. Every web project is going to cost something. Sometimes it’s a hard, monthly, out-of-pocket expense, other times it’s a routine manual task that costs some of your free time. Occasionally, like this project, you can spend a little bit more time and elbow grease planning and executing up front and wind up with a project that is alive-and-well without either of those recurring expenses. In the case of FootballCropTop.com, I have an automatically updating static HTML website with loads of affiliate links, security, scalability, and a 93% Google PageSpeed Insight score (I can’t go higher because of the images hosted by Fanatics.com - boo!) that has added only pennies per month to my existing out-of-pocket expenses. I am indeed using some paid services (like Digital Ocean, Forge, Github, AWS), but because of careful planning and resource conservation, these services are either free because of low utilization or costs are commingled with other projects.